Put the Accubrush XT on a pole and paint the top of the wall against the ceiling with ease! Swivel handle can be used on a pole, or handheld. 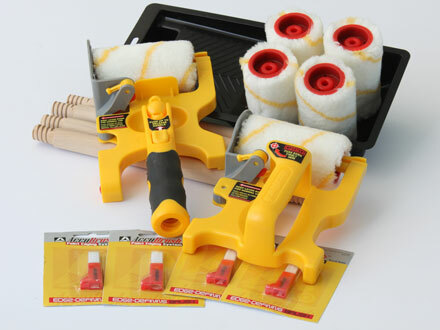 Complete Kit comes with a 40″ pole, or fits any standard paint pole available at Home Depot or paint store. Can be used on very tall ceilings. We use metal and special plastic on the bottom of the shield to ensure that the edger will survive daily use in a professional painting business. 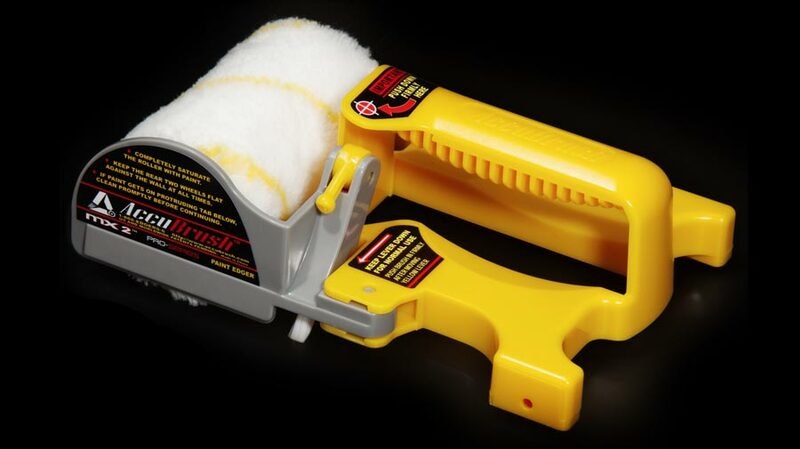 Brush adjuster allows you to move the brush in or out to give you a perfect edge in a wide variety of different situations. 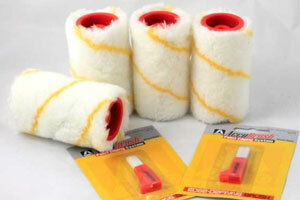 Perfect for painting along textured surfaces or along cabinets which may not be flush with the wall. With our Professional Pole-Mountable unit, your feet stay firmly on the ground while you paint the top of the wall! Not only is this safer, but it saves a lot of time not having to get up and down the ladder over and over again. 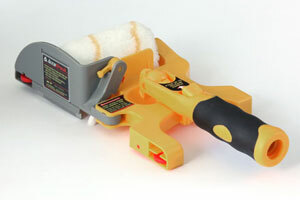 Tool will work along knockdown, orange peel, and other textured surfaces on your walls and ceilings. All this for only $124.95! Easy Payment Plan Available. 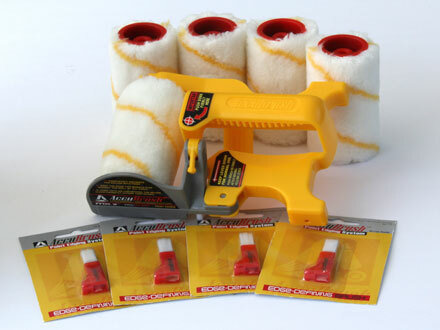 Patented Combination of Roller and Cut-in Brush allows the roller to paint to within 1/8″ of the wall with a rolled texture, giving you a rolled texture virtually from wall-to-wall. The MX has a fixed handle and is designed for handheld use only. It does NOT have a threaded mount for attaching a pole, as the XT professional model does. 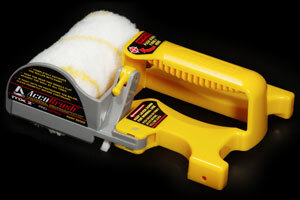 Special no-smear paint shield keeps paint from getting on your trim or on the ceiling. All this for only $39.95! 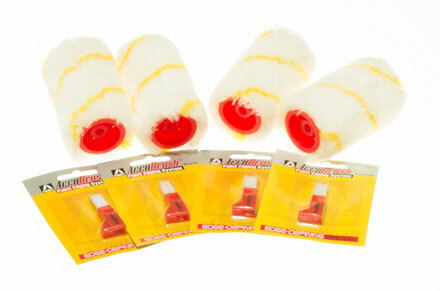 All Accubrush rollers and brushes are washable and reusable. Simply wash them as you would your other rollers and brushes. Our rollers have a special quick-release mechanism which allow them to drop right off the bar by pressing the yellow catch lever. This means that you don’t have to grab the messy roller and pull it off as you do with other rollers. Our rollers are made with a poly blend, about 3/8″ nap, which works well for all surfaces, from a smooth wall to textured. Remember, you are only painting the very edges of the wall with this tool. Brushes and Rollers fit both XT and MX Models. All this for just $24.95! All prices shown in US Dollars. Standard shipping only $4.95 for US and Canada. There is no additional charge for shipping if you order refills at the same time as you purchase one of our edgers.